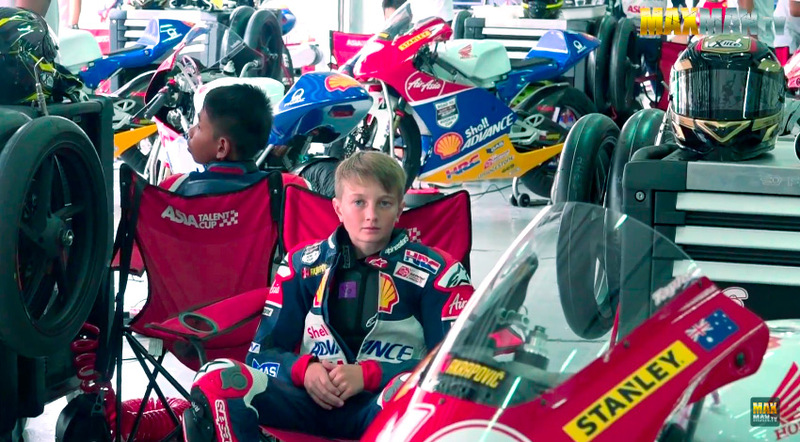 This morning, I received a video about Lachlan Taylor, a young rider who is currently competing in the Shell Asia Talent Cup Test in Malaysia. At 13 years old, he’s already an Australian dirt bike champion. Now he’s moving to road racing, and is racing through the junior series in Asia. I was also fortunate enough to be shared some some background information on about his career, so far. “The 13-year-old (who is the first Australian to be selected for the program) joined riders aged 13-18 from across Asia to compete in the development championship, which encompasses six events and 12 point-scoring races across five countries. Taylor’s achievement is made even more remarkable considering his relative inexperience when it comes to road racing. In only September last year, Taylor was dominating the Queensland Dirt Track and Long Track Titles with podium finishes in every class he rode in, including winning the state 65cc Long Track title. Although Taylor’s focus is firmly on grabbing his Asia Talent Cup opportunity with both hands, he still has one eye on the future. Lachlan is one of those young boys who is clearly very determined, but also very humble. In the beginning of this video, the other riders clearly underestimate him. By the end, Lachlan shows them that he’s clearly got the skills. I loved this story from the moment I watched it, and I’ll be cheering on this young rider in what he’s doing. If there are more videos of Lachlan, we’ll definitely be sharing them on |StartingGrid| Keep it up! This entry was posted in Cool Car Videos and tagged 13 year old, Lachlan, Supebike, Taylor. Bookmark the permalink.